Está ubicado a 20 kilómetros al sur-oeste de Tokio. Cuenta con una pista de 5000´ con una calle de rodaje paralela. Ocupado por el Ejército de los EE.UU. 7º Escuadrón de Comunicaciones, y la 11 Airbone Division. Días después de la entrega, los tres escuadrones de la FG 49 equipados con P-38 llegaron a la pista de aterrizaje. Más tarde, la Marina de los EE.UU. también utilizaría la base. [Después de aterrizar en la base aérea de Atsugi] "Esta es la cabeza de playa donde se suponía que tomaríamos tierra. El General MacArthur me dio esta área. Nunca esperé llegar a él en un avión sin ser recibido a disparos". Muchos aviones japoneses fueron abandonados al final de la guerra en esta pista, incluyendo a muchos Jacks J2M. 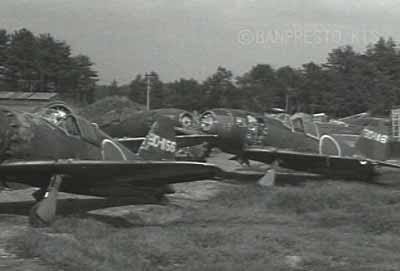 De conformidad con los términos de rendición, sus hélices se eliminaron ..
(7 ª AF) Los P-51 ametrallan las instalaciones y la pista. (7 ª AF) Con 41 ataques sobre las pistas se logran destruir en tierra a 10 aparatos japoneses. (7 ª AF) 7 AACS Wing, recibió la orden de volar al aeródromo de Atsugi y configurar los equipos de comunicaciones necesarios para orientar en el primer contingente de tropas de ocupación. El coronel Blake y sus hombres, parte de una fuerza de 150 hombres de trabajo, voló desde Okinawa a Atsugi, con 24 aviones C-47 cargado con el equipo. Con el fin de llevar al equipo de lo posible, la carga fue aligerada por llevar sólo lo suficiente combustible para llegar a Atsugi. Ki-46 Dinah y Ki-48 Lily con marcas de rendición en Atsugi. (Ejército de los EE.UU.) La ocupación de Japón en vigor cuando se inicia la 11 ª División Aerotransportada es llevada a Atsugi aeródromo. En este día, Atsugi fue el aeropuerto más transitado del mundo. It is located 20 miles south-west of Tokyo. It has a runway of 5000 'with a parallel taxiway. Occupied by the U.S. Army 7 Communications Squadron and the 11 Airborne Division. Days after delivery, the three squadrons equipped with 49 FG P-38 arrived at the airstrip. Later, the U.S. Navy also use the base. [After landing at Atsugi Air Base] "This is the beachhead where it was assumed that we would land. General MacArthur gave me this area. I never expected him to get on a plane without being given a shot." 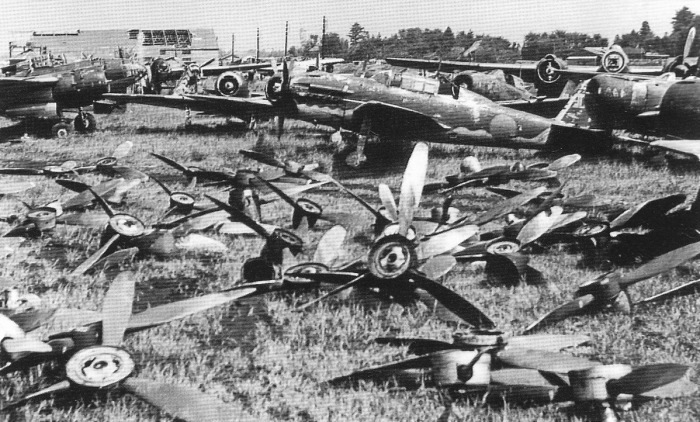 Many Japanese aircraft were abandoned at the end of the war in this track, including many Jacks J2M. In accordance with the terms of surrender, their propellers were removed ..
(7 th AF) P-51's strafe and track facilities. (7 th AF) with 41 attacks on the tracks manage to destroy the ground to 10 Japanese aircraft. (7 th AF) 7 AACS Wing, was ordered to fly at Atsugi airfield and set up communications equipment necessary to guide the first contingent of occupation troops. Colonel Blake and his men, part of a force of 150 men working, flew from Okinawa to Atsugi, with 24 C-47 aircraft loaded with equipment. To lead the team as possible, the load was lightened by carrying only enough fuel to get to Atsugi. (U.S. Army) The occupation of Japan in force when starting the 11 th Airborne Division is carried Atsugi airfield. 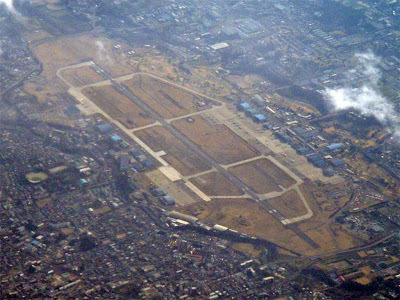 On this day, Atsugi was the world's busiest airport.